Welcome to the Mitsubishi complaints department brought to you by HissingKitty. Experienced poor customer service? We make it easy to file a formal complaint against Mitsubishi online. Simply use our free form and your feedback will be instantly forwarded for review. Need to contact the Mitsubishi corporate office? We have the mailing address, phone number, and email address listed below. I bought a car at the Mitsubishi triplex office in cherry hill New Jersey and was misled and charged an unfair price on a used car. This is consumer fraud because the car was advertised at a cheaper price online and I was charged more. I was told one price and was given another price. Also, there was optional charges that I was not explained to about. I have tried to contact the dealership with no success. I would like someone to contact me or I will take legal action. My phone number is+18563047026. I purchased a Mitsubishi lancer at the Mitsubishi dealer in Victorville, ca on July 07, 2018. My plates expired on 09/2018 and still have not received my tags for my plates. The dealer in Victorville directed me to the Mitsubishi dealer in Costa Mesa since they are in charge of the dmv process. I've called them and spoke to Karen and they given me the run around for the past 2 1/2 months. They told me that the vehicle I bought had a lien on my vehicle. I've spoke to the manager also and she has done nothing to help me. I've even got stopped by police because of my plates and they stated that I need to fix the issue and that I would be given a warning. This has been the worst with the dealer in Costa Mesa. I am so upset that they cannot help me and all they do is give me the run around. I wish I was able to return it back and avoid this headache. Never will I purchase a vehicle with them. I went to City Mitsubishi 10575 Atlantic Blvd Jacksonville,Fl 3225 I was their for a buy back service I suppose to get smart watch and choice of one of 4-prizes it was so bad they couldn't find the gifts and then they gave me a cruise but it was not free it cost 500.00 dollars every time I go their or call Mr.Melvin Jackson we cant or no one return our call I don't like to be Lied too thank you concern costumer.Phone 904-232-0541 home 904-641-2325. I purchased my 2017 Outlander Sport ES on 12-4-17 from the Mitsubishi dealership at 431 Hospitality Lane, Myrtle Beach, SC 29579 During the purchasing process, I had requested numerous times that I wanted a car with a navigation system because I drive for my job. I was told numerous times that it has a navigation system. So I decided to purchase the car even though I did not really want to spend that much money but I did so just for the navigation system. When I returned home with my new car I discovered there was no navigation system. I called the dealer and they told me I needed to download an app onto my phone and it would work off that. I did so and still no navigation system. I returned to the dealership and was told that this model did not come with a navigation system. At that time I was told they would look for a car at the dealership that had a navigation system and switch it out for me. They said they would call me when they found one. I did not receive a call so a week later I called them and at that time I was told there were no available systems to switch out and they would talk to their manager and call me back. a week later I had not received a call so I called back and was given the run around again saying they are still trying to figure out what to do and they would call me back. When my survey came I gave a bad report and within 2 hours they had called me and told me I could either have a new system put in or purchase a new car. I told them I just wanted the new system with the navigation on it. They said they would call me back. Again no call, so I called them and they said to come in. I went in and spoke with Chris Thompson the sales manager and he said he would order a system for me and would call when it was in. Again no call so I called him and he said the weather was bad and could not get ahold of the company that would install it. and that he would call me. Again no call so I called him and he said that they ordered it and it came in but they do not know if they can install it because there is a special BAR that it needs to set on and they don't know if this car has that bar and he would call me and let me know. To this date, I have not heard from him and have tried to call but cannot reach him. I believe I have been scammed. I would not have purchased this car if I had known it did not have a navigation system in it. and the fact that no one returns my calls and gives me nothing but excuses is good reason for me to believe this. I would like this situation resolved asap. I am hoping that you may be able to help me. Please contact me at 440-610-7526 to let me know what you can do. service has been HORRIBLE! I have had a complaint since 2015 and it has NOT been handled! WORSE service in the auto industry I have EVER encountered! Have not been able to contact mediation manager, nor customer service. I will NEVER recommend a Mitsubishi or their service to anyone! The recent television commercial for Mitsubishi Outlander is just absolutely annoying and irritating. It just makes me switch off. It would have to be one of the most annoying songs on television at the moment. It just makes me cringe and want to get up and walk out of the room. Its like a form of pathetic torture. What moron decided on that song for an advertising campaign? Its just plain annoying and stupid. My vote is less than 1. What is it with Mitsubishi Service Dept. MacMulkin Car Dealership 5 Rockne Dr. Nashua NH. Made 2 appt's for Protective Coating Purchased with Car. 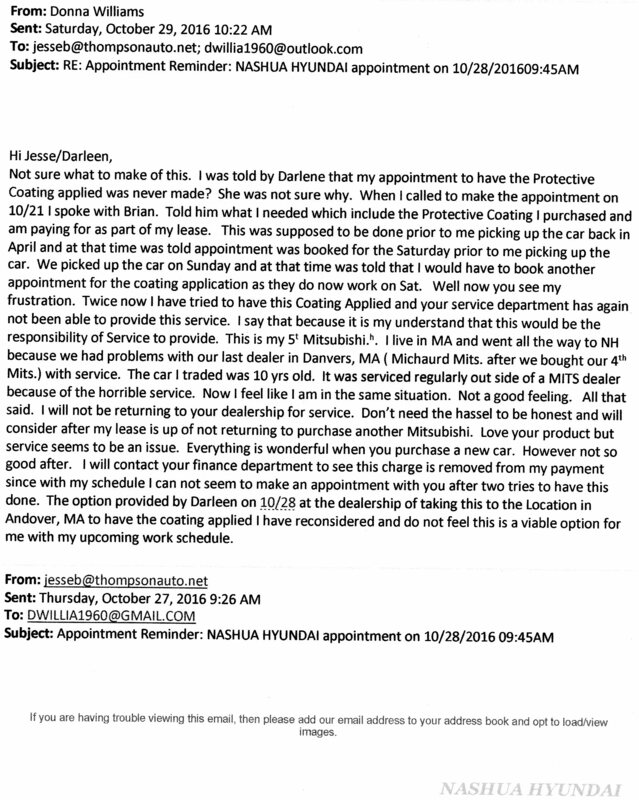 Both were not scheduled by the service department as promised and I am forced to either do it myself and bring it to the coating dealer or continue paying for a product I have never received. Also my service light after the service was performed still goes off when I start my car. Just reached 2000 miles. This is my 5th Mitsubishi. I went to another dealer in a neighboring state because of the horrible service I received from my last dealer. Now receiving the same unacceptable service with my new dealer. Well my lease is for 3 years. Based on the horrible and unacceptable service received after purchasing your vehicles this will be my last. I really love your cars. But based on service after purchasing this will definitely be my last. Hate dealing with you after I purchase the last two. Your service departments take no responsibility and just smile and say I am sorry. Well my time is just as expensive a your service and I am not willing to pay for any of it. If the free first inspection is anything like what I will need to pay for going forward, I am not willing to pay for it. My compliant is so you will looking into your services departments that care for your customers after purchase. They are really lacking in what they are supposed to be providing which is service. Your vehicles will not sell them selves with out the proper customer care they should be providing which is service. My husband traded our Mitsubishi 2011 triton on a Friday at 4:30pm for a 2016 triton and he passed away the next day. He had only driven it 5k home. We immediately asked for help wanting to return vehicle but were treated with no compassion at a very heartbreaking time and 3 months on still no resolution. Note: this complaint has been resolved according to the consumer. Mitsubishi corporate provided an acceptable solution. I have a broken rear glass in the lift up door of my new 3 months old Pajero QE Sport and I am told Mitsubishi have no spare glass in Australia and I need to wait 6-8 weeks for one to come from Japan. What sort of rubbish service is that? Mitsubishi TVs it's been 6 years and my 65 inch TV has stopped working. It comes on then after a few minutes goes of nothing appears on the screen. I purchased a 2014 Kia Optima from Albany Mitsubishi in December 2015. I paid 2,000 dollars down payment and monthly payments of 547.00 a month. On 4/4/16 I returned the car because it was smoking from the tail pipe. They told me at Kia of Albany that it was a internal problem with the motor. The salesman at Albany Mitsubishi told me that there was a chance that they would not repair it, even though I have a 60,000 mile warranty. The car only had 24,000 mile when I purchased it. They told me they needed records of oil changes done by the owners before me before they can fix it. I just don't understand why I have to suffer the actions of others. I only had this car 3 and a half months. I believed the sale man when he told me I was getting a great deal, but come to find out I purchased a lemon. Only thing I want is for some one to PLEASE help me. I understand this is not a Mitsubishi but they do represent the Mitsubishi brand. I purchase a Mitsubishi Outlander Sport on 3/15. I was told by the sales person Scott Payne at Gilma Mitsubishi that I was getting 2 keys with the vehicle but he did not had the second key and was going to call me back to get the second key. I have being calling and leaving messages with the Mitsubishi corporate offices with my complaints and getting no call back. Today when I call and asked to reporting he answer and told me he does not have the key. I believe that if I was promise this I should get my key and it should be the dealer responsibility to keep the promise. He assure me I was getting the second key and know they are backing out on that promise. I fell Mitsubishi should be responsible and provide me the second key for the vehicle. 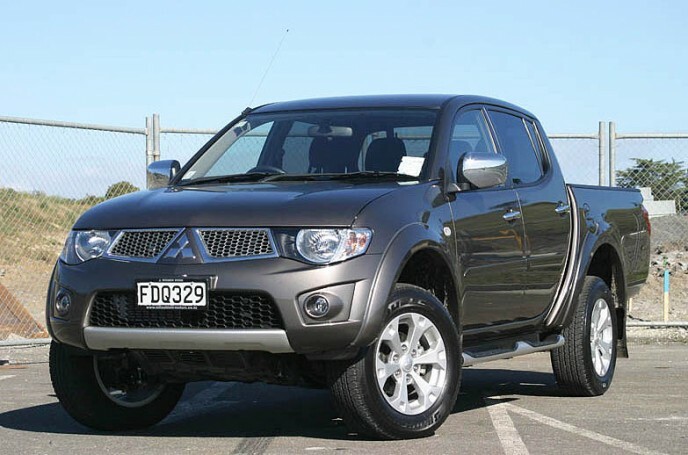 I have never owned a Mitsubishi before but have test-driven and ridden in several over the years. They always strike me as a fairly cheaply made car, which is why I never bought one. I have had friends with Eclipse's, and Montero's as well as a 3000GT. Each one rattled, made noise, and felt like it was about to fall apart. I can imagine if I owned one I would be complaining regularly about this car. Driving on the freeway on 10-18-2015, my Eclipse, started to vibrate/shake, lost the ability to accelerate, check engine light came on, vehicle started to smoke (under the hood), while in the fast lane on the freeway, had to cross lines of traffic to pull the car off onto an off ramp. Took to mechanic, told of the issues hose broke, leaked into transmission/radiator. Took to Mitsubishi where I was told to by dealership (where I purchased the lemon and where my extended warranty was held). Mitsubishi told me that Ford warranty company would not cover anything to repair the vehicle. Due to the manufacturing default, my Mitsubishi Lancer has forced to do skimming on the Rotor Disc periodically (Once in 6 to 8 months), the last time (2 year ago) when the workshop did their skim on the front Rotor discs, it went spoiled not functioning at all. The engineer replaced a new one for me, but it only last 2 years or less than 35000km and spoiled again, after the workshop went to do the Rotor discs skimming. All those costs (changing absorbs) I have to bear on it by myself. I hope Mitsubishi can take things seriously when those issues are caused by your company but not the consumers. The best motors from Japan are made only in Mitsubishi. At least that is what they tell you when you look to buy one. Mitsubishi has become world's top automobile manufacturing brand because of it's quality. However, I feel like that is slipping lately. They have stretched manufacturing and sales to Latin America, Europe, Africa, Middle East, Asia, Oceania and North America. Specifications differ as per the locations, but shouldn't quality always be the same?